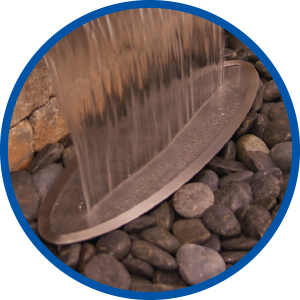 Atlantic's Formal Spillway System takes the guesswork out of adding water to your landscape or hardscape. Minimal noise and splash make this system ideal for indoor applications. Convenient Basin Kits include everything needed for installation, saving time and money. All components are matched for perfect performance every time. 1. Formal Spillway Basins are seamless, leak-proof and molded in sizes that complement most modular wall and paving systems, for easy installation and minimal cutting. 2. Built-in recesses route all the plumbing beneath the basin, including Auto Fill feed lines and low voltage wiring for accent lighting. 3. Basin Kits include all plumbing and fittings needed for installation, with a single union ball valve for easy pump removal and adjustment of water flow to the spillway. 4. All plumbing is contained inside the perimeter of the basin, allowing retaining wall blocks to surround the basin with no notching or cutting. 5. Internal Matala mat prevents any debris from entering the pump and spillway, cleaning the water and diffusing turbulence for even water flow from the spillway. 6. Large pump chamber accommodates the appropriate TidalWave pump with room for the installation of an Auto Fill Valve. 7. Complete Basin Kits work interchangeably with all Atlantic Formal Spillway styles: Colorfalls, Color Changing Colorfalls and Scupper Spillways. 8. Atlantic Splash Rings keep stones in place and splash at bay as effectively as our Splash Mats, but with the appeal of steel and copper. Add an LED light ring under the mesh to illuminate the falls from below.